Engineered hardwood flooring can be refinished, though not as many times as solid hardwood. Can your engineered floor be refinished? That depends on how many times it has been refinished before and how thick the wear layer is. By the way, this discussion applies to engineered parquet flooring too. How Many Times Can Engineered Hardwood Flooring Be Refinished? Let’s do the math. The layer of solid hardwood on engineered flooring is known as the wear layer. It ranges from 1mm to 8mm thick depending on the quality of the flooring. 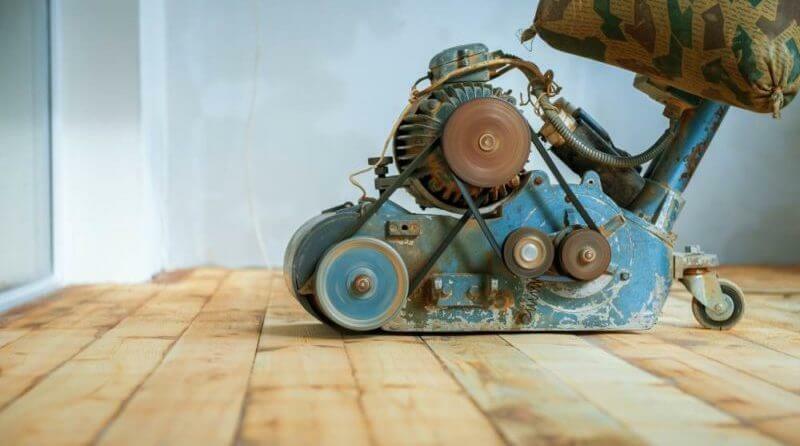 There are factors that reduce the number of times any engineered hardwood floor can be refinished. There are steps you can take to delay the need for refinishing your engineered flooring. Adding a layer of polyurethane sealer to the existing finish, a process known as refreshing the finish, is a good option when light wear that hasn’t penetrated the wear layer is starting to show on your flooring. As a test, if you put a few drops of water on the floor, and they bead up, then the sealer is in good condition and refreshing isn’t necessary. If the water penetrates the wood, it is time for more sealer. Refreshing should be done every 4-7 years depending on how much traffic the floor receives. The cost is 25% to 33% of the cost of refinishing the engineered wood floor. Note too that if you have hand-scraped flooring, refinishing it will remove that effect, so refreshing the finish first is an attractive option. When refinishing is being considered because a few planks are deeply scratched, cupped or stained, replacing the damaged planks (preferred) or repairing the scratches with stainable wood filler can be done for a far lower cost than refinishing the entire floor. The drawback is that the new planks and the wood filler might not be an exact match in color to the existing flooring. There are only two reasons to refinish your engineered floor. First, if there is widespread damage or the floor shows significant wear through the sealer and into the wood, then refinishing is the best option for restoring a like-new appearance. The second reason to refinish engineered hardwood flooring is that you want to change the stain color of the wood. Removing 1mm to 1.5mm of the wear layer should do this on most floors. If you don’t know the history of your engineered floor, then investigating its condition will be necessary. Removing a floor grate will expose the edge profile of the wood and allow you to measure the remaining wear layer. If there aren’t floor grates, find the simplest place to remove baseboard trim or door trim to expose the edge. Using a small prybar might be necessary to lift the edge for viewing. It might also be possible to slip a dental mirror tool into the gap between the edge of the flooring and the wall to view the wear layer. If you’re unsure about the issue, a flooring contractor will be able assist you in determining whether your engineered hardwood can be refinished – or even if refinishing rather than simply refreshing it is the right option. We recommend using a professional to refinish wood flooring and you can calculate the cost here, but if you’re interested in tackling the job yourself then read our guide to refinishing hardwood floors. I applied hardwood polish made by Boni to my Engineered flooring by mistake .. Now my floors have streaks, droppings and look awful from the polish. How ca I get this off. I have tried vinegar and water with no lick. I have tries rubbing alochol in places but not much luck either. What can I do now? My floors were beautiful and want that look back.